... I decided to bend the rule a bit this week. hahaha, wow!this surely would be the icing on the cake!love to see you enjoy yourself like this with the comic again, peter! That is awesome! I will have to cross my fingers too! That is a really cool sketch of Leo! man I wish I had gotten 3 instead of 1! I had no idea you were signing them, man im even more excited about this than I was before. My wifes never gonna hear the end of this. Had no idea orders had opened up! PHEW! I've been waiting on this one. That is so cool. I got my issue #32 in the mail Saturday from Steve's shop. I couldn't be more pleased. I don't do a lot of floppy comic buying like I used to and just don't owning a lot of stuff. I generally do my reading digitally these days, but I make a huge exception for TMNT. This issue is one of my favorite things. I may just have to get another one from you, as I was planning on making an order for a few items that are missing from my collection anyway. 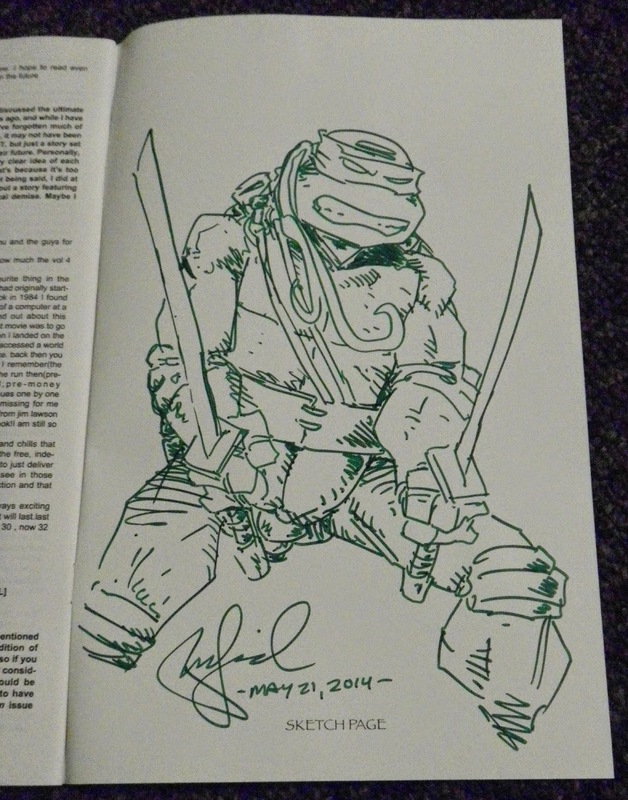 I hope whoever is lucky enough to get this sketch is as thrilled as I would be flipping through and finding it there. I'd love to get to see the smile on their face when they see it. oh man...I wish I had checked this recently. is it to late to order online? This is awesome!! Placing my order for two copies ASAP!! Peter, we would like to make an interview request - what's the best place to do that? thanks! I just received my two copies of #32 in the mail. I did not get the sketch but I'm still very pleased. Thanks for taking the time to sign Peter. I appreciate it. How do i order one ? ?